Without the proper planning, preparation, and long-term thinking, skills-based volunteers and the organizations that sponsor them can easily do more harm than good. A lack of access to skills stifles the growth of social impact initiatives around the world—especially new or locally led organizations looking to achieve scale. These organizations can benefit immensely from the targeted infusion of skills, knowledge, industry insights, and in-person support that traveling skill-based volunteers can deliver. Analysis of skills-based volunteer case studies we’ve done at MovingWorlds—a skills-based, volunteer-matching platform for professionals—has revealed insights into the importance of these volunteers, and their potential to either crash and burn, or catalyze the next stage of social impact. We have supported more than 550 volunteer matches across more than 50 countries. Through a review of impact reports, debrief calls, and personal stories published by our volunteers and their host organizations, we see a consistent theme: Professionals’ skills, connections, know-how, and insights can be catalytic during the pioneering stage of social enterprises, where most organizations and social good initiatives perish. But for these types of engagements to succeed, everyone involved needs to commit to proper planning, preparation, and long-term thinking. Given that a growing number of professionals are seeking skills-based volunteering projects and a growing number of corporate programs are looking to sponsor them, these findings are especially important. We believe our industry stands at a moment of potential peril. Without a set of standards to guide the placement of skill-based volunteers, it could easily go the way of the “voluntourism” industry, where well-intentioned people pay thousands of dollars to make little-to-no impact and often propagate systemic issues—eroding dignity or even creating markets for kidnapping. Yet skills-based volunteers can provide catalytic support. Our work with Ubongo Kids, an African social enterprise that creates interactive edutainment for kids in Africa using the technologies they already have, is a good example. Ubongo has engaged skills-based volunteers at two pivotal points in its growth. In 2013, unable to access the capital it needed to improve its content and start building international partnerships, Ubongo looked for a less-traditional resource to help it grow. With our organization’s help, Ubongo’s leadership team found the expertise they were looking for in Sarah Horrigan. A retired professional with more than 30 years of consulting experience in operations, partnership building, and advocacy, Horrigan was also certified to teach English overseas. In Spring of 2014, the Ubongo staff helped Horrigan find a free place to live for her six-week assignment and scoped out her would-be areas of focus during an extensive pre-trip planning process. This involved a training, a personal preparation checklist, and several collaborative planning calls during which Ubongo and Horrigan mapped out a project and sustainability planning guide. While in Dar es Salaam, Tanzania, Horrigan was tasked with helping Ubongo’s founders gain international exposure for their ideas, helping the content creation team translate Swahili to English, and consulting on improving operations. Her work in these areas helped Ubongo expand, which in turn helped it earn ongoing grant capital from numerous groups, including USAID. Three years later, in 2017, Ubongo was again ready to push its growth to the next level, and develop business and strategic partnerships to bring its content to new mediums and countries. This time, we connected Ubongo with Heather Watkins, a business-to-business marketing professional looking to spend two weeks contributing her skills in East Africa. Watkins helped Ubongo develop an attainable business-to-business marketing plan and, more importantly, transferred critical skills and knowledge to the local team that had previously focused only on direct-to-consumer marketing. M-Kopa Solar tapped data-anaysis and busienss intelligence reporting expertise from the Microsoft-sponsored MySkills4Afrika program before achieving international notoriety. Organizations like women’s empowerment and fair-trade jewelry maker Makarios used supply chain and sustainability consulting from Kering Foundation’s Solidarity Leave Program to improve operations and distribution. Social enterprise accelerator Siemens Stiftung’s empowering people.Network relies on volunteers to transfer highly specialized workers to remote areas, and has completed projects with a database developer and even a coffee roaster. Community-based organizations like Tobby Vision Computers hosted consultants to train trainers on information and communication technology best practices in under-resourced areas. University and community development partnerships, such as Petra University in Surabaya Indonesia, find volunteers to expand upskilling and economic development programs. Many cross-cultural exchanges face common pitfalls. Here’s how individuals and organizations looking to explore skills-based volunteering can avoid them. 1. Thoughtfully identify projects that address local talent gaps. Most often, traveling volunteers find their projects via placement partners, which historically help with “scoping,” or defining project deliverables and outcomes. This structure has notable risks, including misaligned incentives. As the global economy becomes even more specialized, generalist program managers face greater challenges in scoping projects. Successful organizations are using their own goals and skills gaps to guide project identification. Ideally, project scoping should occur between the volunteering professional and the hosting organization, not a middleman. It takes support tools, oversight, and effective program management to effectively guide a volunteer and host organization through this process. Benefits include building a more effective working relationship between the volunteer and host before they hit the field, addressing high-priority work the volunteer can accomplish, and setting reasonable expectations in advance. Volunteers should welcome the identification of real projects—research shows it increases impact and improves the experience of all parties. 2. Embrace collaborative planning with a focus on partnership and cross-cultural readiness. Professional volunteers are busy. So are locally led enterprises. Especially when working across time zones and cultures, it can be challenging to adequately plan. Yet skills-based volunteering engagements fall apart without an effective working relationship. Both sides must be prepped and enter with clear expectations and open minds. Intermediaries should step aside here to ensure that volunteers and hosts build strong partnerships. At the same time, intermediaries must remain engaged in training both parties and holding them accountable as they work through an effective planning process. It’s important to note that almost all skills-based exchanges facilitated by intermediaries require training. We believe it should be mandatory and evolve constantly. We also recommend the use of leadership and cross-cultural assessments, such as Aperian’s GlobeSmart, to provide data-driven insights to help people be more effective across borders. Intermediaries should focus on concepts like cross-cultural collaboration, human-centered design, asset-based community development, and humility, which, when combined prepare volunteers to enter into informed partnerships with local organizations. Host organizations must also invest in preparedness; they must be ready to determine project scope, have the capacity to work with volunteers, and be amenable to absorbing knowledge from other cultures. 3. Focus on solving the most pressing, skills-based challenges. Professionals can help solve specific challenges that a local team can’t accomplish alone due to gaps in knowledge, time, financial resources, and/or staffing power. Help may include things like setting up and training a local team on accounting procedures, implementing a PR strategy, conducting market research, implementing an IT solution, or creating a branding style guide. Even traveling professionals who have only a couple weeks of time to volunteer can accomplish many valuable projects. That said, organizations often struggle to identify their biggest needs and the missing skills that could deliver the most impact. Organizations that in reality need sales people, for example, may request marketers, or database designers when they really need engineers, or user experience researchers when they really need business consultants. To combat this, organizations should assess their impact and organizational priorities, and map those against the current skills on the team. Wherever there is a top priority without adequate skills in-house, that is a sign where a skills-based volunteer can add the most value. 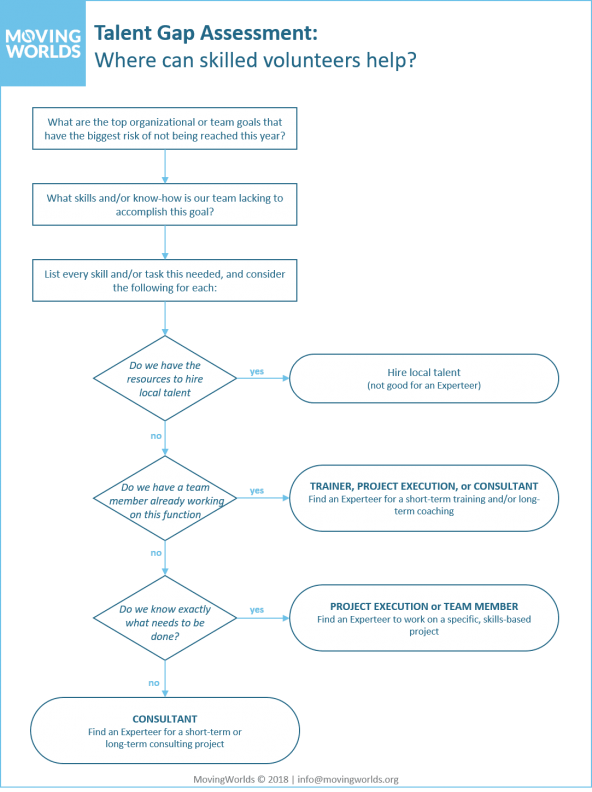 This framework can help organizations identify where a volunteer can add the most value and the best project format. 4. Ensure transfer of knowledge and skills to local team members. A properly defined engagement should see success as something that can be measured a year after the project finishes. In almost all cases, this involves sharing tools, frameworks, processes, industry insights, and/or skills with the local team members responsible for the project. Effective projects plan for this in advance. Volunteer professionals and host organization leaders can help facilitate this knowledge transfer through one-on-one consulting, one-to-many trainings, and/or workshops. 5. Identify opportunities to improve organizational strategy and capability. Organizations working at their full potential are rare. This is as true for optimized tech companies in Silicon Valley as it is for social enterprises in Kibera. Sometimes this is because their operational strategy is not on target, or because they are using tools, processes, and/or management methods that are not ideal for its mission. Volunteer professionals, especially those with extensive experience in a variety of sectors, can share wisdom that will help leaders of smaller teams make strategic and operational improvements. 6. Build connections to a global network. While the value of networks is hard to measure, we consistently hear that connections are one of the most valuable outcomes of these engagements. In Ubongo’s case, Horrigan was able to identify a new leadership grant for creative professionals, Reach for Change, and help Ubongo’s creative director apply. While he didn’t win, his selection as a semi-finalist boosted his confidence and prepared him to look outside for innovative ideas and inspiration. 7. Think strategically about transition and sustainability plans. During the planning process, volunteers must work directly with the field organizations—not middlemen or program managers—to plan the project and define what success looks like. At MovingWorlds, we ask project participants to look ahead and define successful outcomes one year after the project ends so that they focus on what is best for the local organization. This helps avoid the trap of trying to deliver something by the end of the project just so the volunteer has a sense of completion. Skilled volunteers can catalyze change by transferring skills, solving short-term challenges, improving long-term strategy, and creating global connections. They can truly help us make progress, but only if we take adequate care in matching, scoping, planning, doing, and measuring along the way.